Why do I need a Capo? Every guitarist needs a good capo. You may not use it every day, but you still need one. Capos are essential for changing the keys of songs so that you can play and sing them easily. Or to play along with some of your favorite songs that have been recorded with a capo. But, capos can also be used for so much more. Before we get to that, there are many different styles of capos, all claiming to be the best on the market. But which is the best for you? This article will help you with your search to find the best guitar capo for your personal needs. Quick-change by name and quick-change by nature. This rated as the best capo in the review because it was so easy to re-position, while still maintaining a really firm grip on the guitar’s neck. it is handmade in the United States, Texas to be exact by Kyser. Made from lightweight aluminum with a steel spring, it is incredibly durable and even comes with a lifetime guarantee. It’s available in a huge rainbow of colors. From the standards – black, blue, red, yellow etc., to much more unique variations such as American flag, tie-dye, and copper vein. It works superbly on both acoustic and electric guitars, despite being labeled as an acoustic guitar capo. None to be honest apart from maybe the price, but you do get what you pay for. 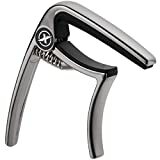 The X3 is one of the most popular and highly-rated capos available. Made from lightweight aircraft-grade zinc alloy, with a polished chrome finish giving the capo a very sleek look. This reassuringly sturdy clamp capo performs well, with a memory steel spring and a high-quality silicone pad. Holding the strings firmly, ensuring great intonation at all frets with no tuning problems. Comes with an Unbeatable Lifetime Warranty! Quality construction from premium-grade zinc alloy with a steel spring and silicone pads. But, this does, however, make it a little heavier than those made from aluminum, which could be a factor for some guitarists. Color-wise, although nowhere near as varied as the Kyser range, The Guitar Capo Deluxe does come in a range of sophisticated metallic finishes. These include brushed bronze, gold, black, and matte silver. It comes with its own branded carrying pouch, making it ideal for guitarists on the go. If you’re on a budget, then the Donner DC-2 could be the best capo for you. It doesn’t have the same premium look or feel, as some of the others in this capo review, but it does offer decent enough functionality and a quality build. It’s made of lightweight high-quality zinc alloy with a steel spring and silicone pads and looks very similar to the Nordic Essentials design. But it’s not as thick in certain sections, and the spring function isn’t as firm. Even so, it’s still very unlikely to cause any buzzing or tuning issues. Its quick-release function works well, but it just doesn’t feel as nice as on the other capos. If price, is a concern or you rarely use a capo, you’ll be more than happy with the Donner DC-2. If however, you plan to use your capo regularly, its best to stick with the recommendations above. Quick Release : super easy to clip on guitar and quick to change. It can even change keys during a song,just clamp it and let your song fly. 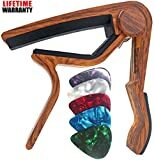 Versatile: this capo can suit your acoustic electric 6-string guitar ,banjo,mandolin or ukulele well. No Buzz :perfectly balanced pressure for that clear tone with strong spring. Well Made:much thicker silicone pad protect your guitars from scratches or demage. High-Grade aluminum alloy for better lock and long time use. And finally, we have the Wingo guitar capo. Another budget offering, but the quality is more than acceptable and it does the job as intended. But Wingo hasn’t been cheap with the materials, which are the same as in many of the pricier capos in this review, high-grade aluminum, and silicon pads. What sets this capo apart is its look, if you want your capo to look like your guitar, then this is the one for you. Its unique wood finish makes it look like it’s made for your acoustic, even though it works just as well on electrics and other fretted instruments. Capo? That’s a funny word. Capo is actually an abbreviation of the Italian word Capodastro which means Head of Fretboard. Its basic function is to change the pitch of the instrument, while still allowing the player to use basic chord shapes. It is a common tool for players of guitars, either acoustic, electric or classical. It is also used on mandolins, banjos, ukuleles, and even bouzoukis. The Clamp is the most popular variety of Capo and uses either a trigger or a spring for tension. Capos are very simple to use, just squeeze the clamp, then place the capo wherever you want it on the neck. Then release the clamp, and the capo is firmly in position. Clamp capos have the advantage of being very easy to move around the fretboard with one hand. On the downside, especially in cheaper models, they can cause problems with the instrument’s intonation. This is because they do not spread the pressure evenly, across the whole of the fingerboard. The second variation in design is the Adjustable Screw Capo. These are also very easy to use. The design allows for more even pressure distribution than the Clamp style, thus, keeping the instrument more in tune. To use, position the capo over the desired position on the fingerboard, and then flip the lever until the capo squeezes into place. 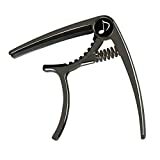 This type of capo does, however, need both hands which makes simple changes much harder than while using the Clamp style of Capo. Yoke-Style capos completely wrap around the neck and use a screw positioned behind the capo to apply pressure, which has the advantage of producing even pressure across the fretboard, which is great for accurate intonation and tuning. They also have the advantage of being able to move up and down the neck easily. The main disadvantage is that they are far harder than the first two designs to attach and take off a guitar. So, they are great for a guitar which is almost always played with a capo. But nowhere near as good, if you only need a capo for one song in your set. There are also a few other basic designs such as toggle capos and strap capos. These do the job but not as well as the three more common designs in my opinion and are best avoided. Capos are all fairly simple, cheap devices and buying one shouldn’t be a complicated decision. But there is plenty to take into consideration or you may end up with a product that doesn’t suit your needs. Let’s start off by looking at what they are made of. Metal capos, such as those made from zinc alloy, aluminum, stainless steel or bronze tend to last longer but are also more expensive. Or if you prefer something more natural looking, there are some great capos crafted from wood. At the cheaper end of the market, you will find plastic capos which tend not be as sturdy or durable. Secondly, having some form of tension adjustment is a good feature, allowing you to fine-tune the pressure of the capo. Ensuring a firm grip on the strings. And finally, rubber is the most common material used for capo pads. Although silicone pads tend to be the best choice and are standard in the more expensive capos. Silicon offers a more secure grip, with less effect on the intonation and tuning of the instrument. Padding in the rear side of the capo is also preferable to protect the finish on the back of the guitar’s neck. Can I use a capo on Any guitar? Some capos are marketed specifically for certain types of guitars, most often acoustics. But the reality is that most capos will work equally well on any guitar, be they electric or acoustic. The neck and fretboard design for the majority of both electric and acoustic guitars are very similar in terms of shape. Therefore, almost any guitar capo will fit either instrument. Do guitar capos work with Banjos, Ukuleles, etc.? Many of the capos included in this roundup are compatible with banjos, ukuleles, mandolins and other stringed instruments. With almost all the most popular capo designs being compatible with varying fretboards. Best advice is to check the product descriptions for suggested uses. Are capos only used for playing open chords? 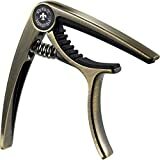 Most musicians use capos to play songs in a register they can sing in, or play other songs that have been recorded with a capo. But there are many other uses for a capo which do make the need to own one essential. They are fantastic songwriting tools. If you’ve written a song and it works but doesn’t sound quite right, try playing it with a capo in various positions to see if it sounds better in a different key. If it does, then you can take the capo off and figure out a way to play the song without the need for the capo. This technique can really take a song you’re working on to another level. It’s also a very useful tool if your recording. The number of uses is up to your imagination but here are a few. Use one to give higher register chords a different bass note to make drones. Use a capo while playing riffs to free up fingers making them easier to play. Or use one to extend chords more than is possible while using only four fingers. And the list goes on and on. If your layering guitar parts while recording, a capo can be your best friend. A capo can also be very useful if your recording a guitar part and the note that you are fretting is producing a slight fret buzz. You could obviously strip the guitar down and get it set-up to remove the buzz, but that is a lot of work. Or you could attach a capo, especially a heavy one to the headstock, not on the neck. You will then be amazed to find that the buzzy fret position may now play perfectly and the buzz has moved either one fret up or one fret down the neck. Sounds incredible, but I assure you it’s true. It doesn’t always work, but it does work more times than it doesn’t. What makes a good guitar Capo? How good the capo was at keeping the guitar in tune. How easily the capo moves from one fingerboard position to another. The amount of fret buzz caused by the capo. The quality of the mechanical construction. Essentially, what makes a great guitar capo is quality construction giving confidence in the product. And a good grip on the neck of the instrument, maintaining perfect tuning and preventing any unwanted buzz. So that’s the rundown of the best capos for either acoustic, electric or classical guitars, or any other fretted instrument for that matter. As previously discussed, what makes a great guitar capo is quality construction giving confidence in the product. And a good grip on the neck of the instrument, maintaining perfect tuning and preventing any unwanted buzz. Taking this into account, the Kyser Quick-Change is the best capo, overall. With the Nordic Essentials Guitar Capo Deluxe a close second, and then the GuitarX. All three are made of quality materials and offer accurate tuning stability. But what sets the Kyser apart is the ease of movement, it’s lighter weight and the vast array of available colors. Although capos are obviously not complicated, there is a lot more to them than most people realize. And hopefully, this article will have answered your questions, made you think of new ways of using capos and provided you with the best advice on which one is best for you. Regardless of the price, all the capos featured are reliable, good-value purchases that will do exactly what you expect them to do. So choose the one that best suits your needs and use it creatively to make your guitar playing even more enjoyable.